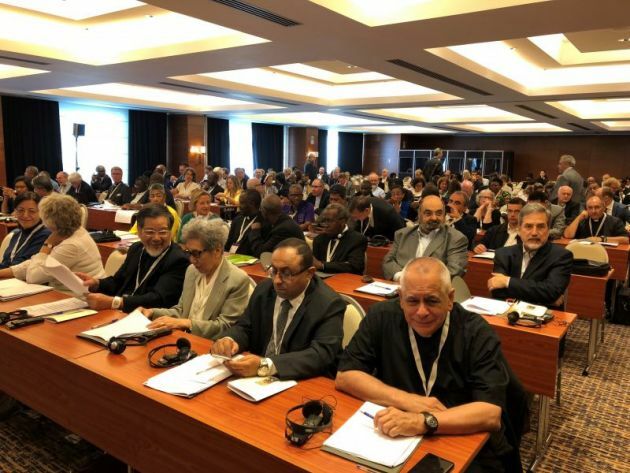 Religious leaders and civil society representatives of different countries and diverse Christian churches have gathered in Rome to urgently discuss combating the world's increasing fear of so-called "strangers." Migrants and refugees attended the Sept. 18-20 conference and offered perspectives on how political and social responses have led to grave injustices or, on the other hand, have given them hope. The "World Conference on Xenophobia, Racism, and Populist Nationalism in the Context of Global Migration" also explored the pivotal role that churches can play in promoting a just and peaceful human society. It discussed "populist nationalism" connoting the deliberate manipulation and exacerbation of people's fears, concerns and insecurities about the negative impact of migration. They looked at how it impacts on their families, communities and cultural identities, for the purposes of political self-interest and electoral advantage. Such fear, conference participants noted, is penetrating all areas of life. These include social, cultural, political and religious institutions. It permeates the media and is influencing public policies and opinions, thus threatening the human and moral values of society, and undermining respect for human rights and humanitarian law. In a greeting, World Council of Churches general secretary Rev. Olav Fykse Tveit recalled when he first learned about the situation of refugees in the world - their fear for their lives and their children's lives. "I still remember first learning about the situation of refugees in the world today," Tveit said. "It was through reading stories about the refugee children from Hungary in the 1950s, fleeing to find a new home. The words 'fear' and 'fleeing' had a very strong impact on me – and still have, I hope." Today, refugees all over the world are fleeing conflict and violence, trying to find a new home, a safe space. "Many even lose their lives on their way, for example in the Mediterranean Sea not far from here," said Tveit. "These crude realities of inhumanity must be addressed together by all who have means to do so. We have to do so also to protect ourselves from becoming inhuman." Churches are called to confront together the destructive forces of xenophobia, racism and populist, exclusive nationalism, he noted. "We are here, because of our passion for the love of human beings," he said. "The main role of the churches is to speak up for the refugees and make space for them," he said. "We must ensure that women and children are always and everywhere protected against abuse and are treated with dignity." Cardinal Peter Turkson spoke about how globalization has had a negative impact on attitudes towards "the other." He said: "As Pope Benedict observed in Caritas in Veritate, globalization has brought us together, but it has not quite converted us into brothers and sisters." He said, "Still, we trust in the many demonstrations of solidarity and compassion and that's why, despite all the obstacles, we want to come together and discuss these issues." "This collaboration between the Catholic Church and the World Council of Churches is part of that ecumenism of life and action that Pope Francis so much encouraged in his recent visit to the headquarters of the World Council in Geneva: Walking together - towards the many existential peripheries of today's world, in order to join in bringing the healing grace of the Gospel to our suffering brothers and sisters." He noted, "In our globalized intercultural and interreligious societies, no church can live and serve in isolation. Ecumenical collaboration is the only way forward." UNHCR regional representative for Southern Europe Felipe Camargo spoke at the opening session. "We have increased our anti-xenophobia efforts in many of our UNCHR operations, promoting partnerships with civil society, with the church, with religious groups, with media and private actors - and we are promoting at the same time education, awareness and curiosity in sharing positive experiences," he said. The world conference is organized by the Vatican's Dicastery for Promoting Integral Human Development and the WCC, in collaboration with the PCPCU. Speakers at the conference noted that the world today is sharply marked by negative impacts of globalization, mass migration and forced human displacement due to poverty, armed conflicts, persecution, climate catastrophes, and violence at all levels.